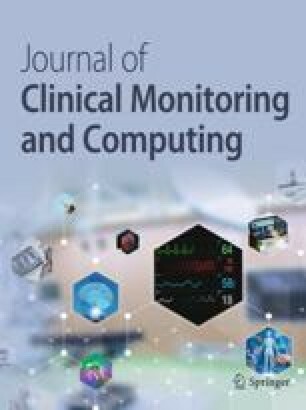 Objective.The aim of this study was to compare clinicallyrelevant performance of: 1) a prototype respiratory sensor based oncapnometry with two alternative signal receptor fixations, 2) afiberoptic humidity sensor and 3) human visual observation. Comparativeprovocation tests were performed on volunteers at the Post-AnesthesiaCare Unit at Västerås Central Hospital. Methods.Theexperimental tests involved 10 healthy, voluntary test subjects,instructed to intersperse normal breathing with protocol provocations ofbreath holding, limb and head movements, and nasal oxygen supplement.The signal outputs from the three respiratory monitoring methods wererecorded on a personal computer. The signal analysis included visualcategorising of the signals and counting breath events. Recognising thatnone of the methods could act as reference, events were classified as“unanimous,” “majority” or“minority” events depending on how many of the three methodsthat detected a breath. Results.The average total recording timewas 37 minutes per subject. The respiratory rates varied from 6.5 to 19breaths per minute, with a mean value of 11.4 breaths/minute. The breathhold duration ranged from 18 to 50 seconds. Discrepancies between thethree methods were found in more than 20% of the marked events.The most frequent majority events were due to events not recorded by theobserver who, on the other hand, contributed the least to minorityevents. The provocations made by the subjects during the measurement didnot increase the rates of majority and minority events, compared toperiods of no provocation. The fiberoptic device exhibited a largercount of minority events but a smaller contribution to majority eventsthan the capnometry prototype. Conclusions.The capnometry andfiberoptic sensors exhibit differences in responses that may beunderstood from basic principles. The importance of the physicalapplication of the sensor to the patient was clearly observed. Theoptimum design remains to be found.